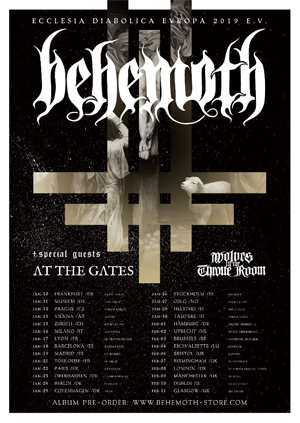 To enhance the beginning of their massive European tour with BEHEMOTH and WOLVES IN THE THRONE ROOM, AT THE GATES will be releasing both a strictly limited 7" EP entitled The Mirror Black and a special Digital EP entitled With The Pantheons Blind on January 11th, 2019. The Digital EP With The Pantheons Blind contains all six bonus tracks from To Drink From The Night Itself recording sessions, which are available digitally for the first time now. The six bonus tracks include "Daggers Of Black Haze" and "The Mirrow Black" featuring guest vocals by Rob Miller (AMEBIX, TAU CROSS), "The Chasm" featuring guest vocals by Per Boder (GOD MACABRE), "A Labyrinth Of Tombs" featuring guest vocals by Mikael Nox Pettersson (CRAFT), a demo version of "The Chasm" and a merciless re-recorded version of the early AT THE GATES classic "Raped By The Light Of Christ", originally featured on the band's sophomore album With Fear I Kiss The Burning Darkness from 1993. 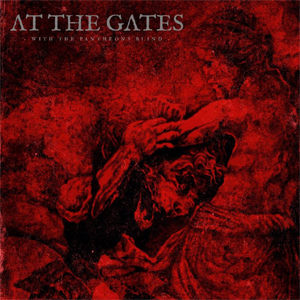 AT THE GATES vocalist Tomas Lindberg states, "The idea of getting guest vocalists on board for the bonus tracks for the album was us trying something new again...This time we wanted to get other artists involved in our music, getting their takes on our new songs. It was a pleasure working with everybody and all songs grew immensely in the process. The songs we did with Rob Miller was for me personally something extra. Of course, people who know me, know that I am a massive AMEBIX fan. And I love the more recent stuff with TAU CROSS too. I had no idea what to expect. But the songs grew so goddamn much together with Rob's powerful voice. We decided early on that these versions were worthy of their own release. This is for me personally one of the greatest achievements of my career, to share the vocal space with one of my favourite vocalists of all time. I am so proud of this release. Hope everyone else gets as much joy out of it as I do." This release follows AT THE GATES most recent album To Drink From The Night Itself. The album was recently featured on Revolver Magazine's "Top 30 Albums of 2018" (#30) and DECIBEL Magazine's "Top 40 Albums of 2018" list (#13). 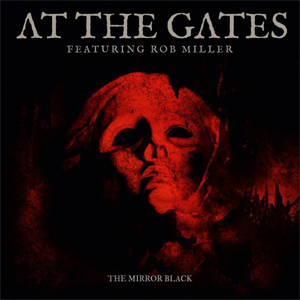 The 7" EP features the two songs "The Mirror Black" and "Daggers Of Black Haze" off AT THE GATES' current album To Drink From The Night Itself and feature guest vocals by Rob Miller (AMEBIX, TAU CROSS). The pre-sale via CM Distro Europe starts today HERE.